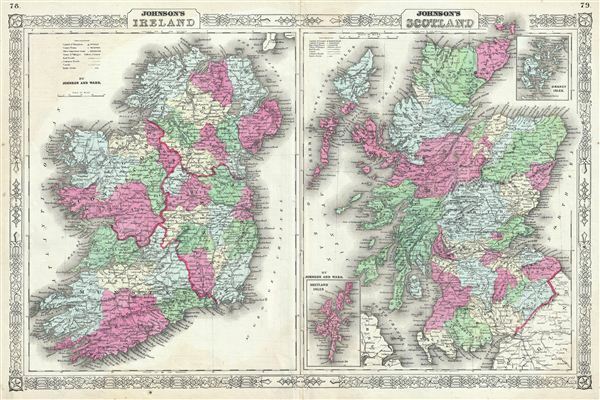 This is a beautiful example of Johnson and Ward's 1865 map of Scotland and Ireland. It contains two separate maps within the same border. The left hand map features Ireland and covers the entire emerald Isle in full from Donegal to Cork. Ireland is divided into its four primary provinces, Munster, Ulster, Connaught and Leinster. During the 19th century, Ireland suffered a series of famines, the worst one being the Great Irish Famine, which lasted from 1845 - 1849 and killed about a million people. As a result Ireland experienced a widespread exodus - mostly to the United States. By the end of the 19th century, almost 50% of immigrants into the United States were from Ireland. The map is color coded according to regions and notes several towns, cities, rivers, and various other topographical details with relief shown by hachure. It features the fretwork style border common to Johnson's atlas work from 1864 to 1869. Published by A. J. Johnson and Ward as plate nos. 78 and 79 in the 1865 edition of Johnson's New Illustrated Family Atlas. This is the first edition of the Johnson Atlas to be attributed to Johnson exclusively. Rumsey 0535.048. Philips (atlases) 4345.